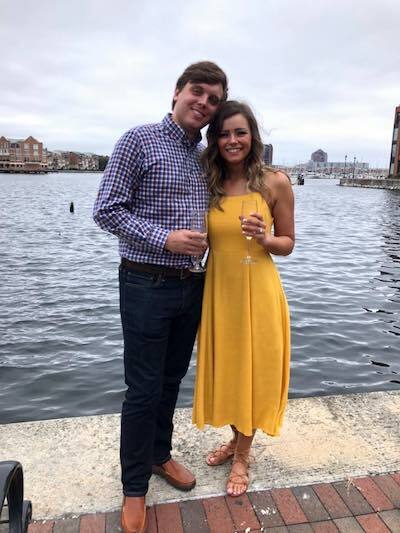 Timonium, MD—Smyth Jewelers was a co-conspirator in helping one of its customers pop the question. The bride-to-be, Kori Klein, is a former cheerleader for the Baltimore Ravens NFL team, and has appeared in two Smyth commercials in the past, once as a maid of honor and once as a wedding guest. Klein’s fiancé, Zach Sullivan, thought it would be a great surprise to “cast” her as a bride-to-be in another Smyth commercial—only instead of an actor, he’d pop onto the set at the last minute for a real proposal and a real ring. With the jeweler’s help, that is exactly what happened. Sullivan used professional social media site LinkedIn to locate Ruthann Carroll, Smyth’s director of advertising, and reached out to her via handwritten letter. She loved the idea. The happy couple celebrates at Baltimore's Inner Harbor. Over the course of two months, Sullivan designed Klein’s ring with the Smyth team (see closeup top of page), and Smyth’s digital marketing manager Nicholas Alger took over as Sullivan’s day-to-day contact for planning the proposal photo shoot in conjunction with Baltimore, MD-based TBC, Smyth’s ad agency. Click here or on the image below to watch the video. The “commercial” was filmed at Charles Street Films, which is TBC’s studio in downtown Baltimore. A rehearsal was held the night before (just like a wedding!) and the live shoot planned for proposal day. On film day, the team got busy doing Klein’s hair and makeup and getting the set and lighting ready, but pretended that the “actor” playing the groom was stuck in traffic and running late. When he finally arrived, Klein was stunned to see her real-life boyfriend walk in with a ring box in hand. TBC wrote the story board, designed the set, and directed and edited the commercial. For now, it’s running on social media (see it here) but it will be used as a real commercial in November and December in Smyth’s market. At press time, it was too early to attribute any additional sales to the Facebook video, but by Monday of this week it had already garnered more than 15,000 impressions, says Emily Noto, senior account executive at TBC. 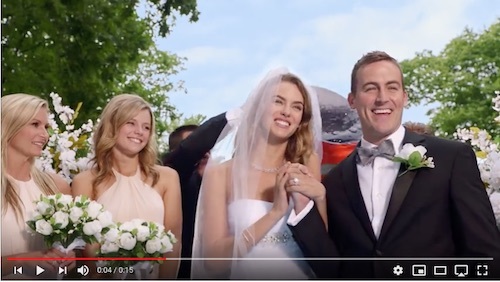 Here are the two prior Smyth commercials Kori Klein appeared in, below. Click on each image to watch. “HOW BIG IS BIG” Kori appears at 00:04 as a wedding guest in the blue/green dress on the left at the table. “GATORADE” Kori is the bridesmaid immediately to the bride’s left.